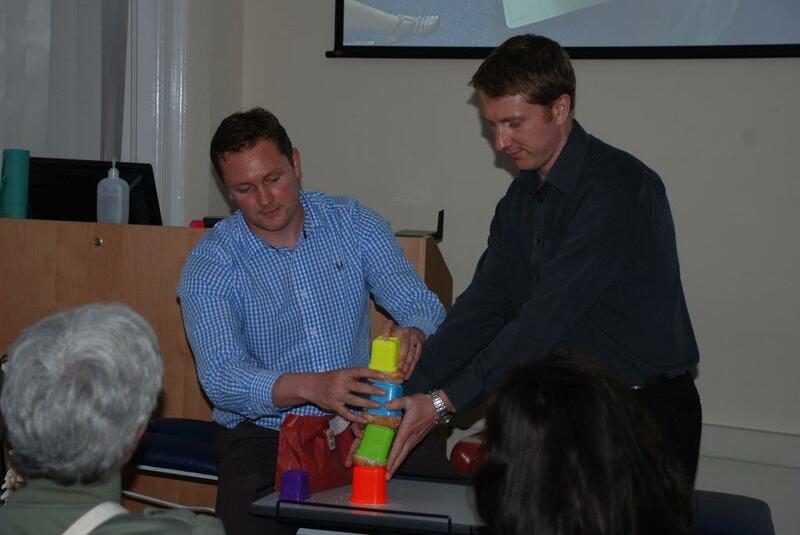 This event was held at the Anglo-European College of Chiropractic (AECC) as part of BU’s Festival of Learning 2014. Jonny Branney and Alister Du Rose hosted the interactive talk looking at the wonders of the human spine. They explained the significance of our spinal disks using building blocks and doughnuts! Participants learned about bones and muscles in the spine and how they interact so we can move the way we do. Jonny Branney reviewed the event in his blog post ‘The Wonders of the Human Spine @BUFestivals 2014 @TheAECC’. Read the extract below or view the full post on Jonny’s blog here. The audience learned about the functions of the spine, and enjoyed a brief history of the visualisation of the spine including relevant history of art all the way through to modern imaging and measurement techniques. They also learned about how trauma, disc hernias and tumours might all be identified with imaging techniques. During the session vertebrae and anatomical models were distributed so that the audience could look at these up close and a demonstration of electromyography gave an insight into how muscle activity might be measured (apparently not all my lower trunk muscles have been replaced by fat over the past year writing a PhD thesis).